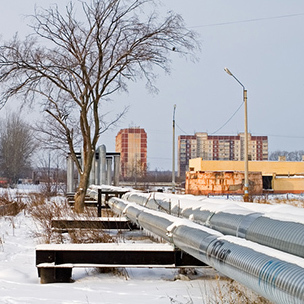 Pipe tracing is a necessity for commercial buildings in cold-climate regions. Pipes are typically equipped with electric heat trace freeze protection and temperature maintenance, and then sometimes wrapped in insulation. Roofs and gutters require deicing systems to ensure safety as well as prevent ice dams. Ice dams can result in costly water damage, so installing self-regulating heat cable along the roof edges helps to prevent these from forming. Warmzone pipe freeze protection systems can be used with both metal and plastic piping, and the self-regulating heat cable adjusts heat output in response to ambient temperatures, ensuring safe, efficient operation. Pipe tracing and roof heating/deicing systems can be adjusted to fit the needs of a wide range of commercial applications. Call or contact a Warmzone radiant heat expert today for a FREE quote or more information about commercial and municipal pipe tracing and roof deicing solutions. Pipe tracing systems use self-regulating parallel circuit heating cables to provide the solution to basic freeze protection applications. The power output of the conductive core material increases or decreases in response to ambient temperature changes. This effect occurs at every point along the length of the cable, thereby adjusting the power output to the varying conditions along the length of the pipe. 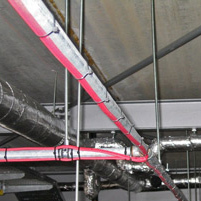 Self-regulating heat cable can be overlapped without creating hot spots or causing a burn out. The self-regulating cable ensures maximum energy efficiency by producing heat only when and where it is needed. 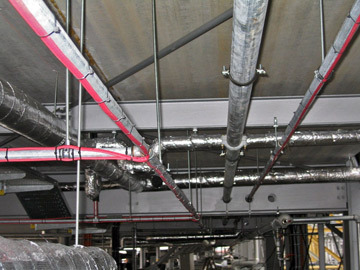 Commercial facilities incorporate long line heat tracing to ensure the safe, proper, cost-effective flow of fluids through piping over long distances. 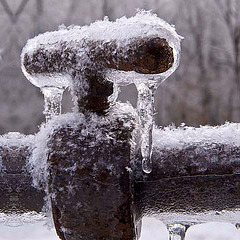 Unprotected/unheated pipes outside of heat trace areas that are exposed to frigid winter conditions are the most susceptible to the effects of cold weather. This can lead to catastrophic pipe failures that can result in significant environmental and property losses. Much of the same technology employed in industrial long line pipe trace systems is also used for commercial applications. Warmzone roof and gutter deicing heat cable features advanced technology that results in highly effective, energy efficient operation. The roof heating systems are fully automated and can be easily customized to heat valleys, gutters, roof edges and other trouble spots to prevent dangerous ice buildup. These durable roof snow and ice melting systems are maintenance free and prevent ice and snow damage as well as enhance safety. Protect your home or business structure by installing an efficient roof heating and gutter trace system.